The most powerful, thrilling, and popular cars ever to race on dirt track ovals spring from these pages! Powerful, 700hp motors pull the wheels of Outlaw Sprints from the ground as they leave the turns and head into the straight-aways. 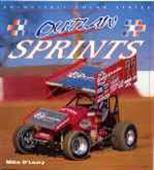 Witness the history, development, technology, and construction of these famous cars, along with revealing driver profiles and techniques, in this behind-the-scenes look at Outlaw Sprints!